Velvet Paw Creations: Lady Atlantis - Rick St Dennis EDT! It's my turn again to share some design team inspiration for the Rick St Dennis EDT over on our Facebook Group, Rick St Dennis Digi Fans and Friends! 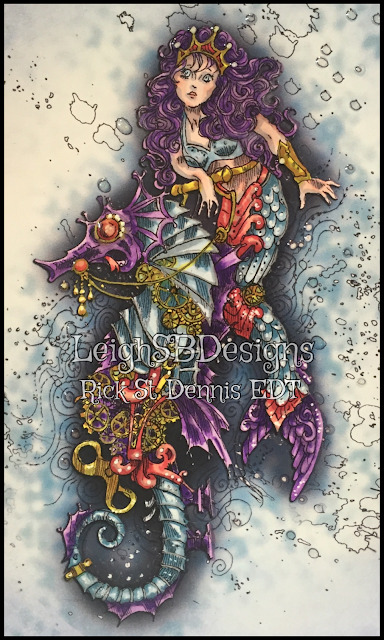 This stunning digi stamp by Rick St Dennis Mfa is called Atlantis especially for Miranda and it's available in Rick's Zibbet store HERE! FYI, in case you haven't heard yet, Zibbet have now introduced immediate digi downloads just like Etsy so you no longer have to wait for your purchase to be emailed to you! YAY! 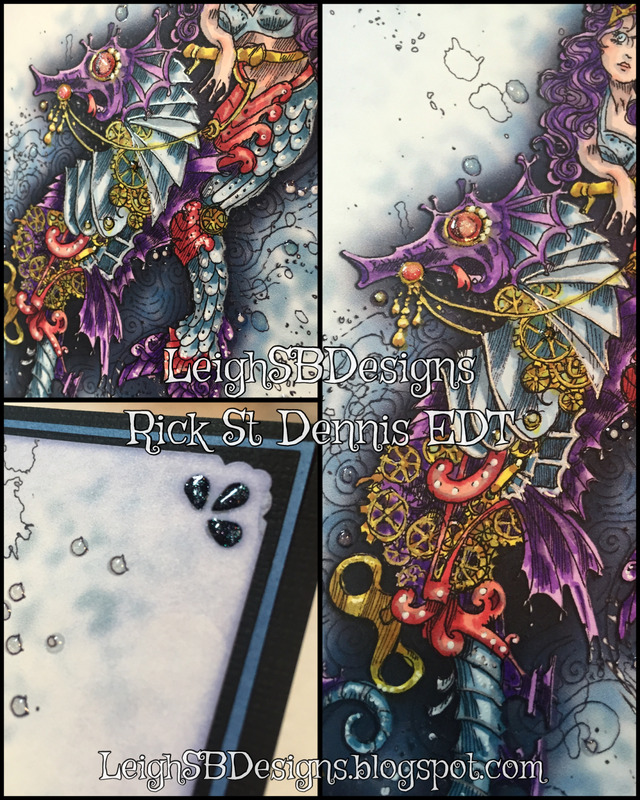 Don't you just love that instant gratification even though Rick was on the ball with his emails ;0) You might recognize the seahorse from this digi, I used him for my Steampunk Seahorse ATC at the beginning of March, check it out HERE if you missed it! I enjoyed colouring the entire image for today's card project this time which started out in Photoshop CS6. I duplicated the digi and erased the background leaving me with just the image on a transparent background which I could then layer over my background work. I drew in my own watery effects...the black bubble/splashes and the subtle blue mottled background as well as the shadows around the image. I also added some beveled effects to the image also which gives the image a 3D effect. 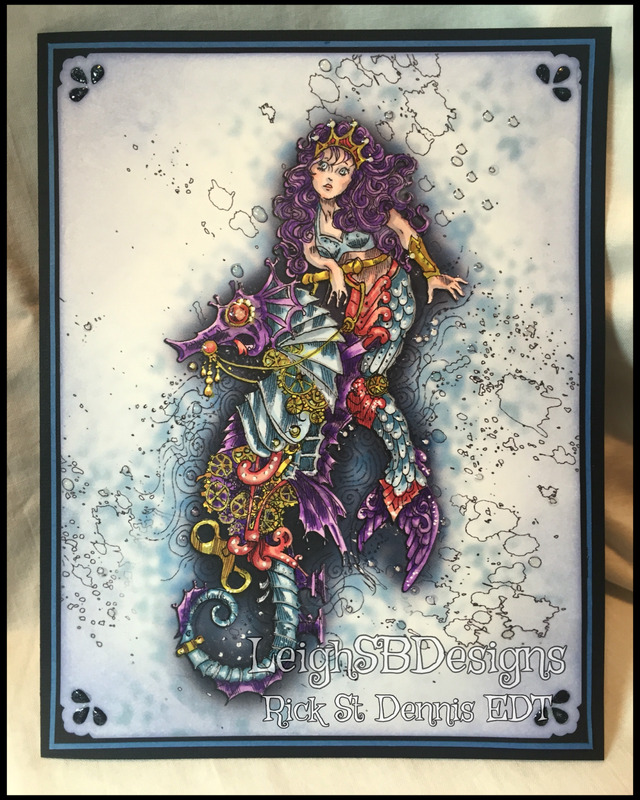 I then printed out on Neenah cardstock and coloured with Copics including white and metallic silver and gold details added with gel pens. I used a scalloped lace Fiskars paper punch on all four corners and applied Shaded Lilac Distress Ink to the edges. The coloured image was then layered onto black cardstock, then colour coordinating blue cardstock and again on a black card made from a sheet of cardstock. 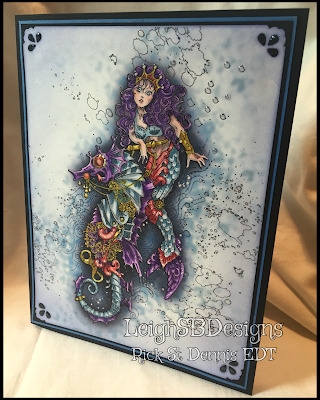 I used my Perfect Layers border tools to cut the perfect borders! I then completed my project with a touch of 3D shimmer with Magic Transparent White 3D droplets applied with a Viva Pearl pen to the image as well as the punched corners. Here's a closer look at the details!